The town of Leadville, where lead had been discovered in 1875, was incorporated in January 1878. Horace A. W. Tabor, 48, became mayor and postmaster for the population of about 200, which was about to begin growing exponentially due to the discovery of gold and silver. Tabor eventually made about $9 million from his investments in mines including the Matchless, but he lost everything during the Panic of 1893. In January 1879, the population of Leadville was 5,040, but in September, it was 40,000. Leadville was reported to have 4 banks, 17 barbershops, 31 restaurants, 51 grocery stores, and 120 saloons. The population of Colorado’s mining towns fluctuated wildly, but the1880 census showed the population of Denver to be 35,629. 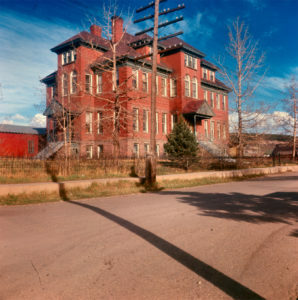 A few days after Christmas 1878, three Sisters of Charity — Sister Bernard Mary Pendergast and Sister Mary Crescentia Fischer, who had just arrived in Denver from Leavenworth, and Sister Francis Xavier Davey, who had been at St. Joseph’s Hospital in Denver — left Denver to open a hospital in Leadville, the second biggest city in Colorado. The Sisters were driven seventeen miles west, to about where Colfax Avenue ends today, where they boarded a stagecoach. A fellow passenger was former territorial governor John Evans, MD, a good friend of the Sisters at St. Joseph’s Hospital who was on his way to Fairplay. The stagecoach passengers were provided with buffalo robes and blankets for the snowy trip into the mountains. The first two nights they stayed at wayside inns, and on the third morning, they got into a coach with runners instead of wheels, pulled through the deep snow by mules instead of horses. The three Sisters of Charity and their companions arrived in Leadville the evening of the third day. The trip from Denver became much easier when the Denver & Rio Grande Railroad reached Leadville about a year later. The Sisters and the People of Leadville Build a Hospital On February 1, 1879, the Leadville Daily Chronicle reported that “Toward the end of December 1878, there came to Leadville over the rough roads and through the storm, [three] noble women. They had heard that up here on the wild mountain top was sickness, sorrow and despair, and they came to comfort. Father Robinson had met Mother Xavier Ross and Sister Joanna Bruner on the train from Leavenworth to Denver in 1872 just prior to his ordination as a priest, and he said that he was so impressed that if he was ever in a town that needed a hospital, he would contact them. Mayor Horace A.W. Tabor began the fundraising by donating $500, and the Sisters had enough to build a hospital within a month. W.H. Stevens, a successful miner, told the Sisters to pick one or more of the lots he owned, and he donated the land and paid the transfer fee himself. During the first year the Sisters treated about a thousand patients. Leadville, which for some years was Colorado’s largest or second largest city, is at 10,152 ft. above sea level. The building wasn’t nearly finished when someone saw the Sisters taking a look and carried in the first patient, Thomas Krating. Therefore, on March 13, 1879 — despite the lack of doors and windows — Sister Bernard Mary Pendergast, Sister Mary Crescentia Fischer, and Sister Francis Xavier Davey opened St. Vincent’s Hospital in Leadville. St. Vincent’s was a two-story frame building with two wings, four wards, and twelve private rooms, for a total of 40 to 50 beds, and Sister Bernard Mary was administrator. At first, the Sisters slept on mattresses on the hospital kitchen floor, and a young man named Frank Wheatley made sure that there were guards outside every night until there were doors that the Sisters could lock. 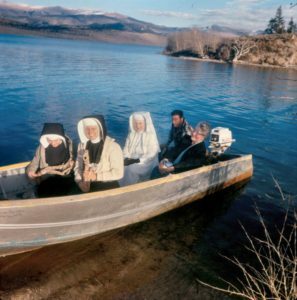 Mother Josephine Cantwell, who since 1877 had been head of the Sisters of Charity of Leavenworth, had been visiting Sisters in Montana. She surprised the Sisters at St. Vincent’s by arriving not long after opening — along with Sister Martha Meade, who joined the hospital staff in Leadville. Mother Josephine, who was an excellent nurse, pitched right in, and the patients said that they were sorry to see her go after her short visit. She also peeled potatoes and washed dishes while she was there to give the Sisters a welcome break. When Mother Josephine got back to Leavenworth, she sent Sister Anastasia Vasey and Sister Mary Marcelline McGrath to join the staff at St. Vincent’s Hospital. There were now six Sisters in Leadville. 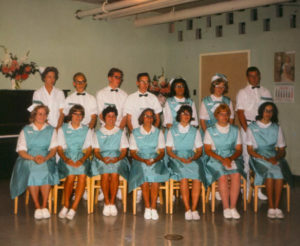 In 1972 the Sisters of Charity of Leavenworth sold St. Vincent’s Hospital in Leadville to a new community hospital district there. Sister Michael Marie O’Leary and the Sisters turned the hospital over to a citizens’ board. Because the sale included a stipulation that the name had to change, it became St. Vincent Hospital. Contact tom@coloradohealthcarehistory.com or @ColoradoHealth on Twitter with additions, corrections, suggestions, or for more information. Thank you!